Mr. Boisjoly did not succeed in gaining acceptance of his objections to the Challenger launch. Moreover, he was shunned by colleagues, even after the investigation concluded, showing that his objections had been correct. He eventually resigned from Morton Thiokol. It is difficult to say from this distance, but this outcome could be an example of excoriation and ejection of a dissenter. Photo courtesy the Online Ethics Center at the National Academy of Engineering. 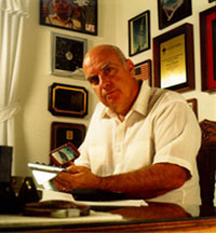 Note: Roger Boisjoly died on January 6, 2012. When I wrote this essay (January 30), I was unaware of his passing. For more about him, see "Towards More Gracious Disagreement," Point Lookout for January 9, 2008. When someone in a decision-making group raises a disquieting question — about a supposed fact, an assumption, a report, whatever — the group might focus on the individual who raised the question, rather than the question itself. They might attribute to the questioner dark motives or character defects, such as intentionally sowing dissension, or not being a team player, or being negative, or worse. If the group sees a pattern of such behavior, or if the questioner is in the minority, the group might stigmatize the questioner, even if the questions raised were legitimate. This pattern of group behavior can prevent the group from foreseeing the foreseeable. By limiting its access to questions about its decisions, it exposes itself to the risk of flaws in its process, which can lead to errors. Here are three indicators that a group might be focusing on the questioner, rather than the question. In what follows, I'll use the term dissenter to denote the person who has raised the disquieting question. Groups can fail to address dissenters' issues in several ways. Issues can be dismissed; brushed aside after cursory, biased, or disingenuous investigation; simply ignored; moved to the "parking lot" never to be retrieved; or assigned to investigative committees that fail to report back until too late. Does your group deal forthrightly and promptly with disquieting issues raised by dissenters? Sometimes the respect paid to disquieting issues is based, in part, on the identity of the originator. In effect, the group confuses the importance of the issue with the social status or motives of the dissenter. When this happens, groups are less likely to foresee the foreseeable, because they're more likely to overlook important issues. of the originatorraised, is the action taken truly independent of the originator's identity? Some groups resurrect issues that were initially raised by dissenters, but which were eventually set aside. The issue can suddenly become legitimate when someone else resurrects it, possibly with new terminology, or accompanied by claims that conditions have changed and the issue is now worthy of consideration. A pattern of issues originated by dissenters, then set aside but later dealt with after being resurrected by members of the majority, suggests that the identity of an issue's advocate influences the group's evaluation of issue significance. Does your group resurrect issues originated by dissenters after they have been set aside? Would you like to see your comments posted here? rbrenfBdvItHSbljabzBhner@ChacRssaWnmPcDWaFtbGoCanyon.comSend me your comments by email, or by Web form. I offer email and telephone coaching at both corporate and individual rates. Contact Rick for details at rbrenVBvLsoRBznNCXAEKner@ChacTSDzQdHuxQhtYxzzoCanyon.com or (650) 787-6475, or toll-free in the continental US at (866) 378-5470.